FOXI1 antibody LS-C15274 is an unconjugated rabbit polyclonal antibody to human FOXI1. Validated for ELISA, IHC and WB. FOXI1 antibody was raised against synthetic peptide (KRKSDVSSSTASLAL-C) CORRESPONDING TO HUMAN FOXH1A (KLH). Molecular Weight: 41.3KD. Percent identity by BLAST analysis: Human, Tamarin (100%); Chimpanzee, Gorilla, Gibbon, Monkey, Marmoset (93%); Pig (87%); Mouse, Rat, Elephant, Panda, Dog, Bovine, Rabbit, Horse, Opossum (80%). 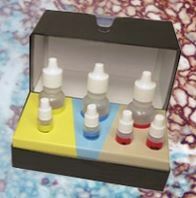 Suitable for use in ELISA, Immunohistochemistry and Western Blot. ELISA Titer:1:250000. Western Blot: 1 ug/ml. Band detected at 40kD using 293 cell lines and at 65kD using human colon. Immunohistochemistry: 10 ug/ml.